Raising the bar for everyone delivering desktop search as a product, Exselo with its latest release of Exselo Desktop gives you the best experience in finding and showcasing information in any of your files, documents, pictures, music, movies, emails etc. The product is available for both Windows and Mac and works with information regardless of where it is stored, i.e. on your local disk, in your cloudstores, inside Microsoft Outlook, on your network drives and across your own and your co-workers computers. Not only will Exselo Desktop help you become more efficient in your working day, also you can easily and securely share information and collaborate with friends, colleagues and partners like never before. As a small taste of Exselo's vision, "Orchestrate Your World", the inclusion of Search Profiles in the product lets users personalize how information shall be searched for and displayed. 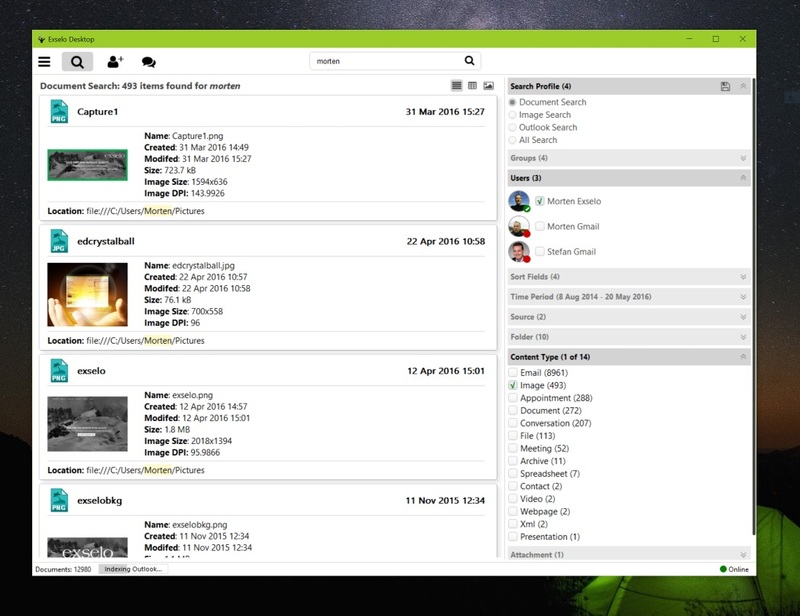 The stored Search Profiles give quick access to frequently done searches, and further boost productivity for the Exselo Desktop users. Even more exciting functionality is in the pipeline, so stay tuned to get the latest from us. The best part: Exselo Desktop is totally free to download and use! Download Exselo Desktop from the download section on our webpages.